Mad for all things vintage but harbour a soft spot for Taylor Swift? You can have both with one of our jazz-meets-pop bands – a formula made famous by the YouTube phenomenon Scott Bradlee’s Postmodern Jukebox. All of our postmodern jukebox style bands and singers perform modern pop songs in the musical genres of yesteryear: jazz, swing, blues, ragtime and doowop. Many of the bands here dress up in 1920s gear – perfect for a Gatsby-themed party where guests can dance and sing along to the pop music they grew up to. Whether you’re planning a themed event or just want sophisticated entertainment that won’t blow your eardrums, our vintage-feel bands will go down a storm with grandkids and grandads alike. Also check out our jazz bands and 1920s Gatsby-style bands. Authentic postmodern style swing band who play swing classics as well as pop songs in a swing style. Extra musicians available. Sophisticated female fronted swing & jazz band that will take you back in time with a varied repertoire including modern songs with a vintage twist. Additional musicians available. An inebriating mix of jazz, swing and modern pop hits delivered by world class musicians. Additional musicians and afternoon sets also available. 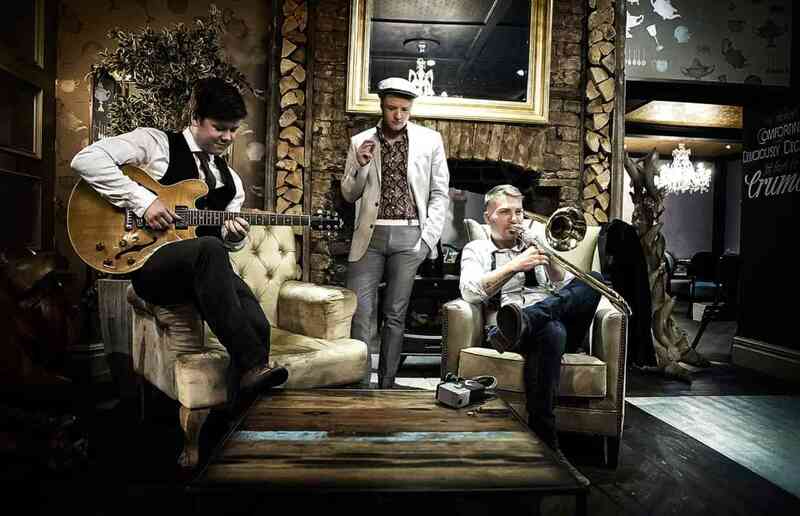 Classy, stylish vintage band inspired by Postmodern Jukebox. The band play all your favourite chart hits from a 1920s Charleston version of 'Put Your Records On' to a Motown-style arrangement of ‘Can’t Feel My Face'. Quirky vintage swing band with a fantastic female lead putting a retro take on modern songs like Get Lucky, Uptown Funk and Billie Jean. Additional musicians, acoustic jazz sets and laptop DJ service available. Combining vintage Rat Pack swing with jazz twists on modern pop, Postmodern Swing Club perform classic music of the 50's, alongside sophisticated swung up hits from Nirvana, Meghan Trainor, Oasis, Katy Perry, Radiohead, Lady Gaga and many more! Larger line-ups also available. Stylish vintage swing act from featuring three sassy female vocalists. 3 to 8-piece line-ups including horn section available, additional options include sax and afternoon sets. Exciting swing band playing pop tunes in their unique style! Additional musicians, acoustic sets and DJ service also available. Superb 3-piece vintage vocal harmony band featuring 3 stunning female vocalists, also available with a full band and DJ service. Stunning close harmony 4-7 piece band featuring three fantastic female vocalists who re-arrange soul, rock and pop songs to give them a vintage style twist. Various line ups and acoustic sets available. Tantalizing soloist singing the best of vintage and postmodern jazz in sparkling 1920s style. Full band also available. Hugely entertaining and swinging 1920s-style jazz band, who have previously performed at Wembley Stadium. The band put their own unique and eccentric take on modern pop, from Taylor Swift to Motorhead! Swing trio perfect for drinks receptions and early evening entertainment. These experienced musicians deliver their own unique twist on jazz standards and chart hits, from Frank Sinatra to Michael Jackson. A violin virtuoso and a guitar maestro combine to form this charming, stylish and swinging gypsy duo with a repertoire covering jazz, tango and pop. Optional double bass for added oomph! Vintage jazz band fronted by an incredible female vocalist/drummer playing modern songs with a retro twist, as well as standards from the 20s and 30s. A variety of line-ups are available to suit any event. Exciting renditions of modern pop songs with a jazzy, vintage speakeasy style twist! Additional musicians and jazz/lounge quartet also available. Swinging vintage-themed band playing a mixture of modern hits in their quirky vintage style, as well as authentic 20s-40s material. Duo, trio and additional musicians also available. Outrageous jazz, swing and postmodern jukebox style band! 3 to 6-piece line-ups available. Dynamic, swinging jazz band with an extensive repertoire, featuring fantastic male vocals. The band are regulars at Ronnie Scott’s and The Jazz Café. Variety of ensemble sizes are available such as big band afternoon jazz quartet and DJ service. Versatile jazz band featuring female vocals and re-working popular modern and old-skool 90s music a vintage, retro style. They can also perform a pop, Motown, soul and rock party set. Additional musicians and afternoon entertainment available. The Charleston Stampede play popular hits from roaring 20s. Enjoy this visit to an era of wonderful nonsense, quirky original music and cheerful entertainment. Let’s misbehave! Classy function band playing classic pop hits in their signature jazzy style. Additional brass players and afternoon duo performances also available. Talented gypsy jazz trio playing their own arrangements of tunes ranging from swing & jazz classics to modern pop anthems. A lively and experienced acoustic gypsy jazz trio playing the music of Django Reinhardt and other jazz standards, plus arrangements of classical tunes and modern rock ‘n’ pop favourites.